To ensure your air conditioner operates smoothly, you need to keep it in optimal condition and clean it from time to time. Getting this done early in the Summer is ideal and after periods of heavy use you will need to check it out and most likely re-clean it as things like dust and debris can build up in your filters. Here is what you need to know about getting your air conditioner safely and thoroughly cleaned. When you’re going to clean your air conditioner, you should consider your own safety. That means you need to make sure to have the power supply and the weatherproof isolation turned off. The outdoor unit of air conditioners also contain an electrical charge and it will take some time before that charge goes away. You should also be wary when you’re dealing with electricity because you can get electrocuted fairly easily. Depending on the filters you have, they might be replaceable or reusable. If they’re replaceable, you may want to consider buying brand new ones and replacing them. If they’re reusable, you should take them out and clean them so they’re good-as-new. During summer, you should be cleaning or replacing your filters every month to make sure your air conditioner is filtering your air properly. When your filters aren’t changed, they can become overloaded and mould can develop in your home. When there is mould present, it can damage the structure of your home and it can endanger your overall health. You can suffer from respiratory issues and skin irritation. In severe cases, water can build up in your lungs. If you want your whole ducting to be cleaned, you should definitely be calling a professional. That’s because you can often find ducts in walls or ceilings and you shouldn’t have to deal with this on your own. When you have ducts that function properly, your air conditioner will more energy efficient. If you want to maintain the ducts, you can swipe the parts of the ducts that you can see. This will keep them clean as long as possible and will ensure that there’s less work for a professional cleaner to do. Your ducts are another place where mould can accumulate. When condensation appears on your ducts for an extended period of time, mould will develop around them and on the walls connected to them. When you need to have your air conditioner cleaned, you may want to consider consulting a professional. That’s because he or she will know how to handle cleaning your air conditioner in the best manner, amongst other cleaning duties. When a professional deals with your air conditioner, you can always trust that it will be cleaned properly and efficiently. 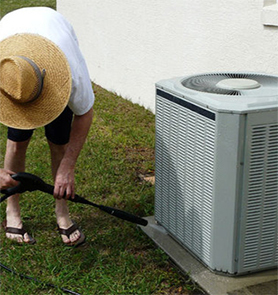 If they find something wrong with your air conditioner, they will be able to tell you for sure so that you can get it upgraded or fixed rather than be left guessing, or worsening the issue by trying to fix it yourself! Your air conditioner will make life easier this Summer. Make sure to keep all of the above in mind when the time comes to clean it out so that your air con’s functionality, your home airways and your health are not compromised. Considering a full professional clean of your home including a deep clean of your carpets and your air conditioning units is worth the comfort you will experience during the warmer months. For more information about professional air conditioner cleaning and maintenance and other domestic cleaning services, feel free to contact the experts at Dom Care Cleaning today!